Football goal post safety is something we take extremely seriously. And while, as an industry, we have made great strides in improving standards and codes of practice, it is vital that those who purchase and maintain goal posts understand their ongoing responsibility. This is why we have produced our very own information pack on goal post safety, and continue to be a leading voice – and innovative manufacturer – in this key area. To go alongside our information pack, this is the first of two articles on the topic and deals with standards and codes of practice. The second article goes into more detail on our recommendations for goal posts and anchorage. Harrod UK is proud to have been at the forefront of improving goal post safety standards by being part of key European and British organisations for a number of years. We have been the UK's representative on the Comite' de European Normalisation (CEN) Safety Standards Committee since 1989 and were a member on the 2003 FA Guidelines Committee. That committee's brief was to issue a definitive guide to goal post safety and Harrod UK has been successful in getting the Football Association and Health & Safety Executives to issue directives to all users of free-standing goals to advise that they must be anchored at all times. Sadly, when goals do not conform to these standards there will always be a risk of serious injuries or, even worse, fatalities. American initiative Anchored For Safety records such incidents in North America – including one in 2015 – and this only goes to show how important it is to ensure that we remain vigilant. It is why there are strict guidelines in place – laid down by the Committee for European Standards – which state that all full-size, free-standing goals for sports such as football and hockey must be firmly anchored throughout their use. Failure to comply could lead to prosecution. It is also important to point out that the use of steel cup net hooks has been banned by the FA since 2007. When it comes to purchasing products, clubs should always look for those which conform to British Standard for European Normalisation (BS EN) standards. All Harrod UK senior goals have been independently tested by a recognised testing house and conform to BS EN 748. Certificates of conformity are sent with all goals. The testing of goal posts is completed via two stages: strength and stability. The crossbar must be tested for strength to avoid problems with it snapping. To pass this test, a crossbar must be able to withstand a vertical force of 180kg (400lbs) applied to its centre for one minute. It should then not have a permanent deformation of more than 10mm after 30 minutes have elapsed. For mini soccer and small-sided goals, the weight is reduced to 80kg, or 30kg when the total mass of the goal is less than 18kg. The stability test sees a horizontal force of 110kg (242lbs) applied to the centre of the crossbar. The goal must remain stable and not topple over. For mini soccer and small-sided goals, the weight is reduced to 70kg, or 30kg when the total mass of the goal Is less than 18kg. A code of practice exists for football goals – British Standard (BS) 8461 – which covers procurement, installation, storage and inspection and maintenance. Let's take a look at each in detail. Goals, nets and fittings should conform to specific standards: BS EN 748 or BS 8462. Goals and accessories, such as nets and anchors, should be purchased as a complete unit, and replacement items should always be bought from the original manufacturer or supplier to ensure that the combination will continue to conform to safety standards. As with any product, it is important to firstly ensure that the goal has not sustained damage and that there are no parts missing. Installation should then only be undertaken by, or under direct supervision of, trained people. Socketed goals should always be set into concrete, in a minimum cube of 60cm x 60cm x 60cm. Free-standing goals must be anchored at all times – whether in use or in storage – and can be considered safe only when properly stabilised. The use of items such as pins, u-staples or screw-in anchors on natural turf pitches is not recommended because of the unpredictability of the ground conditions. They should be used only if there is evidence that they are effective under the worst possible ground conditions. Extreme care needs to be taken when most types of goals are moved as they are detached from anchors, weights, fixing points or sockets, and are therefore unstable. Full-sized goals should never be moved by fewer than four adults, all of whom should be physically fit and capable. Goals should never be dragged across the ground and goals fitted with wheels should be moved in accordance with the manufacturer's instructions. Due care and attention should be placed on storing goals when not in use. They should never be left accessible, upright or unstabilised, and socketed goals should most definitely not be left leaning unsecured against a wall or fence. They should be locked securely to a wall or fence, or left lying flat on the ground. Moveable goals may be chained face to face in pairs but if there is no secure method of storage then it is safer to leave them in place, properly stabilised as if in use. Goals are frequently moved and assembled, ready for use by children and adults, and those responsible sometimes have little perception of danger. If these goals are not inspected prior to use by referees, coaches, teachers or parents, then the consequences could be far-reaching. The conditions under which goals are kept and used vary greatly, so it is not possible to provide one specific inspection timetable. 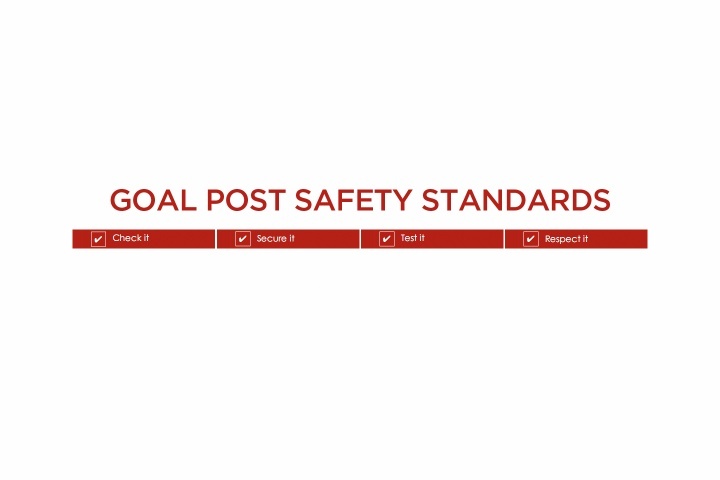 However, our goal post safety guide provides three inspection examples – weekly, annual and any time a goal is repositioned – which cover checking net fixings, positioning of anchors and strength and stability tests. If a goal is damaged or if faults are found during an inspection then the goal should be withdrawn until fixed. Goals should not be modified or repaired by welding or substituting incorrect parts. A permanent identification label should be attached to every goal and, once a new one is installed, a log book should be established to record everything from first installation to regular inspections and when faults were recorded and fixed.